The deep, protected waters of Irvington's Carters Creek attract both boating and fishing enthusiasts. With direct access to the Rappahannock River and the Chesapeake Bay, there is much to explore and enjoy. From Drum and Striped Bass to Speckled Trout and Bluefish, the fishing is legendary. Chesapeake Bay crabs and Rappahannock oysters are equally abundant in the bountiful waters. Marinas are nearby to accommodate boats of almost any size draft. 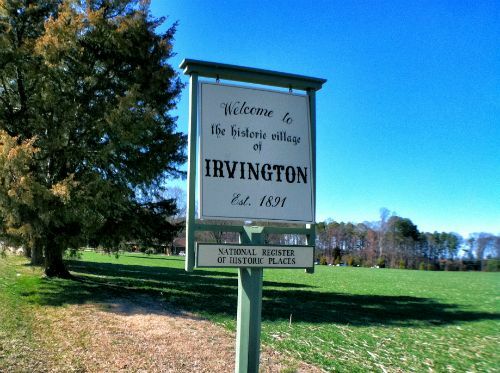 Irvington was first explored by John Smith in 1608. From 1873 to 1891, the town was called “Carter’s Creek Wharf” or often just “Carter’s Creek”. In 1891, Irvington citizens renamed the town “Irvington”, after a prominent resident. As a Baltimore Steamboat landing, Irvington was a popular steamboat town during the 1890s and early 1900s. A stroll through the residential area reveals a rare collection of architectural styles. Many of these treasured homes are listed in the Virginia and National Register of Historic Places. Beautiful waterfront homes and gardens are nestled along the banks of Carters Creek. Opened in 1947, The Tides Inn and Resort, overlooking Carters Creek, is known across the United States and brings many visitors to Irvington throughout the year. The highly acclaimed Hope & Glory Inn and nearby B&B’s complete the excellent accommodations available for Irvington visitors. Today, Irvington is home to boutique shops, fine restaurants, museums, art galleries, farmers market, and the Dog & Oyster Vineyard. Irvington parades and celebrations are a slice of Americana. An especially popular event is the Fourth of July Parade and evening concert, performed by the USAF “Heritage of America” Band. With a modest population of about 400 residents, one would assume that Irvington is a quiet, little-known village near the Rappahannock River. However, Irvington is well-known for its picturesque streets and architecture, its prime location on the eastern banks of Carters Creek, the nationally acclaimed Tides Inn and Resort and its historic roots as a Chesapeake Bay coastal town.